Since the introduction of Kasai’s hepatic portoenterostomy, the prognosis of patients with biliary atresia has improved. The presence of intrahepatic biliary cysts or bile lakes has been reported in some patients after the intervention. Bile lakes have been related to cholangitis and a poor outcome. Objective: To describe the clinical features and prognosis of patients with biliary atresia after Kasai portoenterostomy, with special emphasis in those who developed biliary cysts. 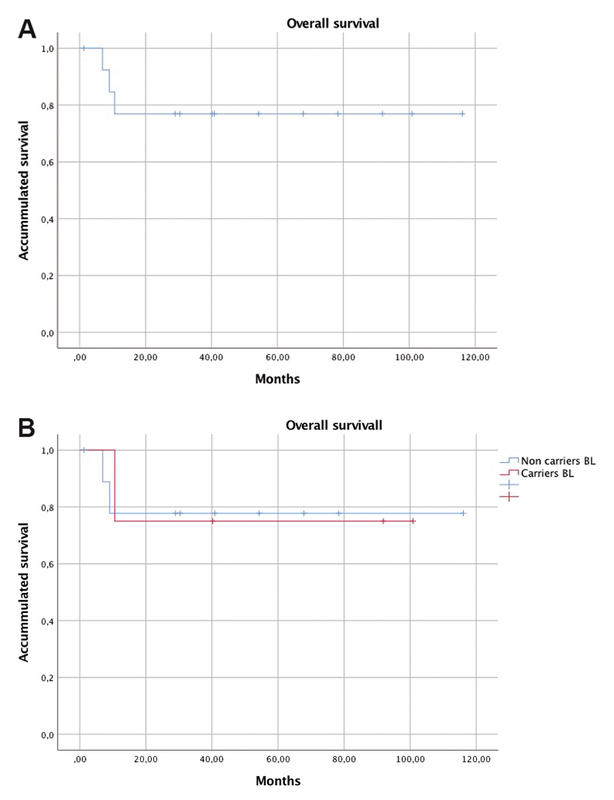 Patients and Method: Data from a retrospective cohort of 13 patients with biliary atresia with a Kasai portoenterostomy from 2008 to 2016 was analyzed. Demographic variables associated to Kasai portoenterostomy, hepatic transplant, biliary cysts and colangitis episodes were tabulated. Kaplan Meir and Log Rank test were used to evaluate colangitis-free and native liver survival. Results: The mean age at Kasai was 85 months (SD 40.3, 42-193 months), six patients (46%) had a Kasai operation after 90 days of life. Four patients (31%) developed multiple biliary cysts; all of them had at least one episode of cholangitis. Cholangitis-free survival was significantly lower for those who developed bile lakes. Nine patients (69%) underwent liver transplant, 3 of them because of recurrent cholangitis. There were no differences in global survival or native liver survival between patients with or without biliary cysts. Conclusions: The incidence of biliary cysts after Kasai portoenterostomy in this series is similar to the reported. The results are consistent with the relationship proposed between the development of biliary cysts and cholangitis. Our patients, some already derived for evaluation and liver transplantation, underwent Kasai operation at an advanced age, which determines a poor prognosis. Biliary atresia (BA) is an inflammatory, progressive, sclerosing cholangiopathy, which affects segments of the intra and extrahepatic bile duct to varying degrees1. It is typical of the neonatal period and manifests itself with cholestatic jaundice, acolia and hepatomegaly2. Without surgical treatment, it invariably progresses to cirrhosis with portal hypertension, liver failure and death in approximately two to three years3. BA is a rare disease, its incidence globally ranges from 1/8,000 to 1/18,000 live births1. A slightly higher prevalence has been reported in female patients and in Asian countries of origin4. There are no data on its incidence in Chile5. It tends to occur as an isolated pathology in 80-90% of cases; however, it can be associated with other congenital abnormalities6,7. It has also been associated with antenatal exposure to viruses and toxins and to a deregulated neonatal immune reaction, suggesting that it may be the common final pathway of response to biliary injury in this developmental period6,8. BA is currently the leading cause of liver transplantation in the pediatric population3. National series identify it as an indication of up to 43% of liver transplants in children under 18 years of age9. Since 1959, the portoenterostomy procedure described by Kasai and Suzuki, has dramatically changed the prognosis of patients with BA10,11. The surgery aims to restore biliary flow from the liver to the intestine10. This is the initial treatment of BA and seeks to preserve the liver function; the better results are achieved if the procedure is performed before three months, and especially in patients operated before sixty days of life12. For 20% of the patients undergoing surgery, this is the definitive treatment13. In the remaining 80%, it serves as a bridge therapy to liver transplantation, allowing its morbidity and mortality to be reduced due to timely referral14. After the Kasai portoenterostomy, bile lakes corresponding to cystic dilations of the intrahepatic bile duct have been described as a finding15. Some studies report an incidence that varies between 18% and 30% of patients after surgery16,17. They are usually diagnosed by abdominal ultrasound and may be single or multiple17. There is little knowledge about the physiopathology and origin of bile lakes18. Histology descriptions highlight the presence of a fibrocystic wall, damaged bile ducts and invasion by inflammatory cells19. This has allowed researchers to propose theories that relate them to biliary stasis, lithiasis and cholangitis; they would be the consequence of altered bile ducts fused together due to the fibro-obliterative process proper to the BA and aggravated by cirrhotic changes of the hepatic parenchyma19. Its clinical course is unknown and the information available in the literature is scarce, an association with episodes of cholangitis has been observed and consequently a worse prognosis for its carriers17,20. Our objective is to describe the clinical characteristics and prognosis of patients with AB carriers and undergoing Kasai’s portoenterostomy, with special emphasis on those who developed biliary lakes during their progression. Retrospective study of non concurrent cohort, which considered patients with a diagnosis of BA undergoing Kasai portoenterostomy and controlled in our center, between 2008 and 2016. Data were obtained from the corporate electronic registry. The demographic and variable information associated with Kasai’s portoenterostomy, liver transplantation, biliary cysts and bile lakes and episodes of cholangitis were tabulated. The results are presented in percentages, mean, median and/or range according to their distribution. Kaplan Meier curves and comparison were created using the Log Rank test to assess overall survival, cholangitis-free and native liver free, considering a p-value as significant. The SPSS 24 (BMI) program was used for statistical analysis. Thirteen patients have been tested with the diagnosis of BA during the period between 2008 and 2016. Demographic data are presented in Table 1. From the total cohort, eight patients (62%) were operated in our center, the remaining correspond to referrals after the portoenterostomy for follow-up and/or liver transplantation. Five patients (38%) achieved total bilirubin levels under 2 mg/dL in the third postoperative month. Six patients (46%) underwent Kasai surgery after 90 days of life due to a late referral. Four patients (31%) developed bile lakes during the follow-up period. All were diagnosed by ultrasound, and multiple cystic lesions, both simple and complex, were described. The diagnosis of bile lakes was made on average at 7.5 months after the Kasai portoenterostomy, with a range of 1 to 18 months. The finding in two patients was within the context of a first episode of cholangitis, in the third patient it was after 5 months of his first cholangitis and in the fourth patient was after 15 months. From the total number of patients with BA, 54% have had at least one episode of cholangitis during their progression, diagnosed by fever and bilirubin elevation without another focus. All patients with bile lakes have had cholangitis at some stage, while for the others, the incidence of cholangitis was 33%. 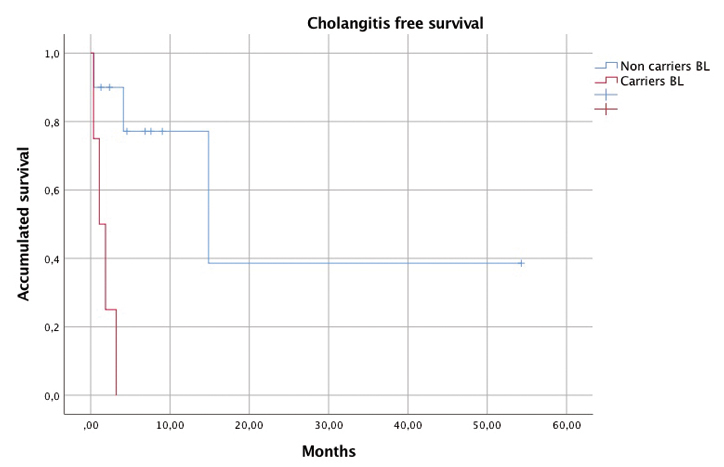 The average post-operative cholangitis-free survival of Kasai was 19.3 months for the series, being significantly higher for those who did not develop biliary lacunae in their evolution (27.3 months vs. 1.6 months, p = 0.001), the data is shown in Figure 1. Figure 1. Cholagitis-free survival curbe (months) for patients with or without bila lakes. (Kaplan Meier). 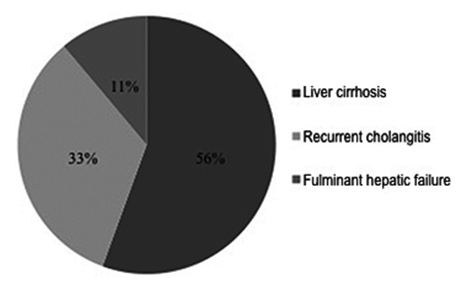 Nine patients (69%) received a liver transplant; in 5 (56%) the indication was liver cirrhosis, in 3 (33%) –all with bile lakes– recurrent cholangitis, and related complications; and 1 (11%) with fulminant liver failure (Figure 2). No patient has developed bile lakes or cysts in the transplanted organ. 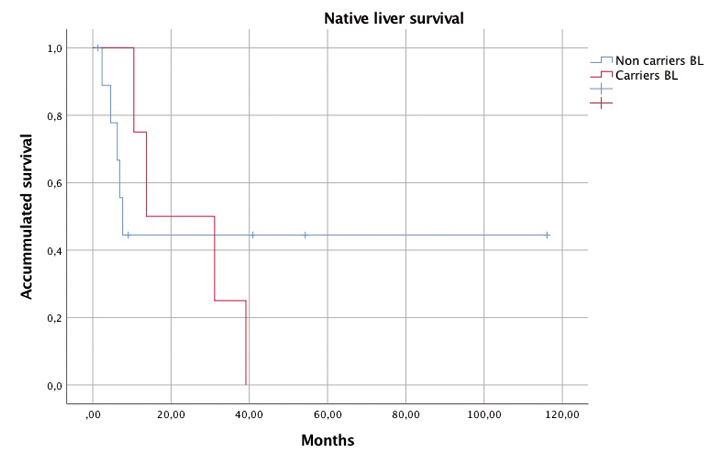 The survival with native liver in the cohort has a median of 13.7 months, with no statistically significant differences between patients with bile lakes and those who did not develop them (p = 0.76) (Figure 3). Figure 2. Indication for liver transplantation. Nine patients from study group were transplanted; in the graph the causes and distribution are shown. Figure 3. Native liver survival (months) for patients with or without bile lakes (1,97 years vs 4,5 years, p = 0.76) (Kaplan Meier). The cohort’s range of follow up was between 7 months and 9.6 years, with median follow-up of 3.3 years. Mortality in the series was 23% (3 patients) and overall survival was 7.6 years, with no significant difference for patients who developed or did not develop bile lakes in their progression (6.5 vs. 7.7 years, p = 0.995) (Figure 4). Two patients died from transplant-related causes after their surgery, while the remaining patient died on the transplant waiting list for complications related to liver cirrhosis. Figure 4. Survival rates (months). (a) Global survival and (b) survival for patients with or withot bile lakes (Kaplan Meier). The introduction of Kasai’s portoenterostomy changed the prognosis of patients with BA10,11. However, the effectiveness of surgical correction is closely related to the time when it is performed. If the diagnosis of the disease and restoration of biliary flow is not early achieved, a marked liver dysfunction will be present and progress to cirrhosis, similar to the natural history of the underlying disease12. 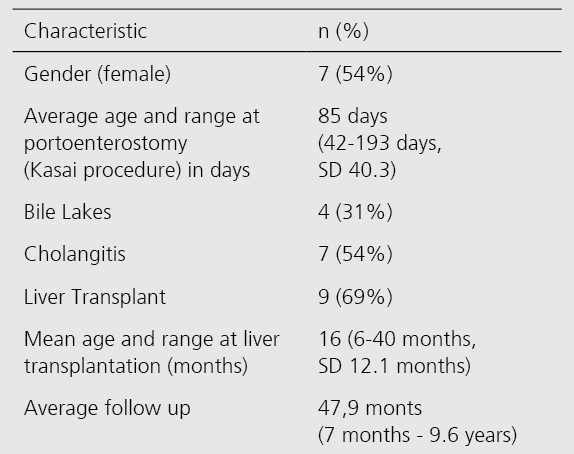 In the cohort presented, the age at which the portoenterostomy was performed is noteworthy late; the average for the series is 85 days of life and 48.3% of the total was operated after 3 months of life. This is probably explained by the fact that our center receives and concentrates referrals for transplantation, the only definitive treatment for patients with BA who are still undergoing Kasai surgery and progress to cirrhosis and liver failure. Since the first case report of bile lakes or cysts reported in 196021, the development of these lesions has been recognized as one of the frequent complications following Kasai’s portoenterostomy22. In our series, 4 (31%) of 14 patients developed bile lakes, similar to the incidence rates described (18-30%) in the literature, mainly in patients of Asian origin16,17,23. A single available study exposes the occurrence of bile lakes in patients with BA who were not undergoing a portoenterostomy24, which was not evident in the cohort given that all patients received surgical treatment. It has been proposed that the development of intrahepatic cystic lesions would be an early complication in the postoperative period of the portoenterostomy23, however the reported ranges are variable17,20,22,23. In our experience, bile lakes were always preceded or in relation to an episode of cholangitis, and in a wide range of follow-up; in two cases it was early in the first postoperative month. The association of biliary lakes and cholangitis was proposed from its first description21, however, no causal relationship has been established between the two entities22. All patients with bile lakes in the series has had at least one episode of cholangitis in their evolution; two of them prior to the discovery of the lesions, while in the remaining two the diagnosis was made during or immediately after the first biliary tract infection in the post Kasai period. When comparing cholangitis-free survival in our series, it appears to be significantly less for those who are carriers of these cystic intrahepatic lesions compared to those who do not develop them. Our data support the association between biliary lake and risk of cholangitis, although a larger cohort is needed to confirm this. The present results are only available to patients with multiple biliary lakes. It has been proposed that the morphology of the lesions would be determinant in their clinical course; they have been classified into simple, single or multiple cysts, and complex according to their ultrasound characteristics18. Anatomopathological analysis has shown that single simple lesions lack biliary epithelium and would be pseudocysts, unlike multiple or complex lesions, which could have their origin in dilated bile ducts, explaining the phenomenon of biliary stasis, lithiasis and association with episodes of cholangitis19 (Figure 5). Figure 5. Bile lakes. 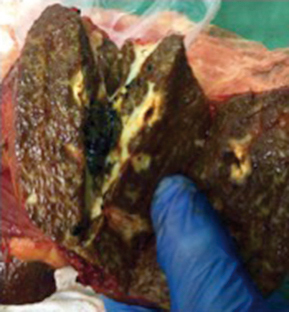 (a) Explanted liver in a patient with bile lkes. 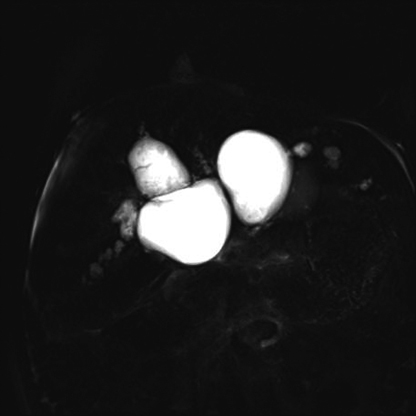 Macroscopic appearence of lesions, those were described by imaging as confluent complex cysts. Multiple dark pigmented stones (arrow). Panel (b) and (c), cRNM axial and coronal. Multiple simple cystic perihiliar lesions are observed. 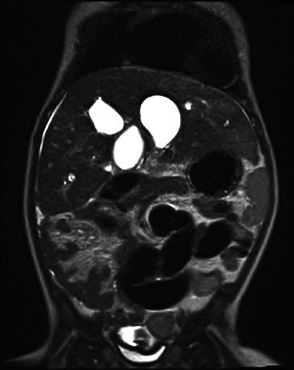 (d) cRNM axial, multiple complex lesions are shown. No recurrence of biliary cyst has been reported after liver transplantation in patients with BA undergoing Kasai portoenterostomy, nor have we evidenced this in our series. This suggests that they may be the result of intrahepatic and local phenomena, not determined by systemic factors. In part this may explain why there is no good treatment for these lesions; transhepatic drainage has been used successfully only in patients with single cysts; prolonged antibiotic therapy controls infection but does not improve cysts and only liver transplantation has been effective as definitive treatment25. Some authors suggested resective surgical treatment, but it has been ruled out as invasive and of little use in patients who would be likely transplant candidates17,25-26. Other groups report that after finding biliary lakes, progression of the underlying disease accelerates17,20,25. For us, this was not reflected in the global survival analysis nor with native liver, as no statistically significant differences were found. However, it is important to note that the sample in the series is small and biased, adding to the experience of a single center that concentrates transplantation referrals. In conclusion, biliary lakes are a relatively common finding in patients undergoing Kasai portoenterostomy for BA. Altered drainage of the bile duct, recurrent infections and probably intrahepatic biliary structural abnormalities contribute to its development. Our results are consistent with the proposed relationship between them and episodes of cholangitis, indirectly associated with a less favorable evolution and the possible need for liver transplantation. In patients in our series, many of them already derived for transplantation, Kasai procedures were performed late, which determines a worse prognosis in the treatment of BA12. 1. Basset M, Murray K. Biliary atresia. J Clin Gastroenterol. 2008;42(6):720-9. 2. Nizery L, Chardot C, Sissaoui S, et al. Biliary atresia: Clinical advances and perspectives. Clin Res Hepatol Gastroenterol. 2016;40(3):281-7. 4. Tiao, MM, Tsai SS, Kuo HW, Chen CL, Yang CY. Epidemiological features of biliary atresia in Taiwan, a national study 1996-2003. J Gastroenterol Hepatol. 2008;23(1):62-6. 6. Superina R, Magee JC, Brandt ML, et al. The anatomic pattern of biliary atresia identified at time of Kasai hepatoportoenterostomy and early postoperative clearance of jaundice are significant predictors of transplant-free survival. Ann Surg. 2011;254(4):577-85. 7. Khalil BA, Perera MT, Mirza DF. Clinical practice: management of biliary atresia. Eur J Pediatr. 2010;169(4):395-402. 8. Caponcelli E, Knisely AS, Davenport M. Cystic biliary atresia: an etiologic and prognostic subgroup. J Pediatr Surg. 2008;43(9):1619-24. 9. Uribe M, Buckel E, Ferrario M, Godoy J, González G, Hunter B, et al. Pediatric Liver Transplantation: Ten Years of Experience in a Multicentric Program in Chile. Transplant Proc. 2005;37:3375-7. 10. Kasai M, Suzuki S. A new operation for “non-correctable” biliary atresia; hepatic portoenterostomy. Shujutsu. 1959;13:733-9. 11. Tainaka T, Kaneko K, Seo T, Ono Y, Sumida W, Ando H. Intrahepatic cystic lesions after hepatic portoenterostomy for biliary atresia with bile lake and dilated bile ducts. J Ped Gastroenterol Nutr. 2007;44(1):104-10. 12. Chung PH, Wong KK, Tam PK. Predictors for failure after Kasai operation. J Pediatr Surg. 2015;50(2):293-6. 13. Ng VL, Haber BH, Magee JC, et al. Medical status of 219 children with biliary atresia surviving long-term with their native livers: results from a North American multicenter consortium. J Pediatr. 2014;165(3):539-46. 14. Wilhaber B. Biliary Atresia: 50 years after the first Kasai. ISRN Surg. 2012;2012:132089. 15. Shimadera S, Iwai N, Deguchi E, et al. Predicting factors on the occurrence of cystic dilatation of intrahepatic biliary system in biliary atresia. Pediatr Surg Int. 2010; 26(6):611-4. 16. Caruso S, Miraglia R, Milazzo M, et al. 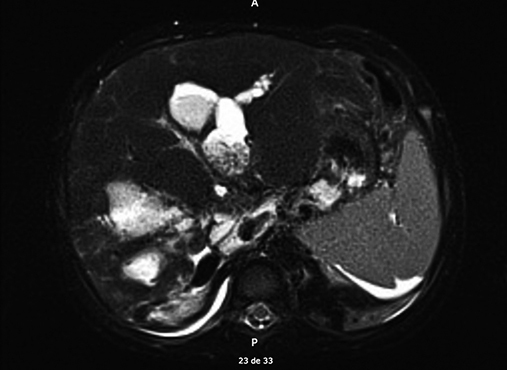 Multidetector computed tomography hepatic findings in children with end-stage biliary atresia. Eur Radiol. 2010;20(6):1468-75. 17. Bu L, Chen H, Ni Y, et al. Multiple intrahepatic biliary cysts in children with biliary atresia. J Pediatr Surg. 2002;37(8):1183-7. 18. Inoue Y, Kato Y, Tamura T, et al. Prognostic implications of bile lakes after surgery for biliary atresia. J Pediatr Surg. 2008;43:2165-8. 19. Tainaka T, Kaneko K, Nakamura S, Ono Y, Sumida W, Ando H. Histological assessment of bile lake formation after hepatic portoenterostomy for biliary atresia. Pediatr Surg Int. 2008;24:265-9. 20. Dayan B, Ledder O, Verstandig AG, Fisher D, Cytter-Kuint R, Granot E. Bile lake post Kasai hepatoportoenterostomy in biliary atresia. Harefuah. 2015;154(3):171-4. 21. Cameron R, Bunton GL. Congenital biliary atresia. Br Med J. 1960;(2):1253-7. 22. Goda T, Kubota A, Kawahara H, et al. The clinical significance of intrahepatic cystic lesions in postoperative patients with biliary atresia. Pediatr Surg Int. 2012;28:865-8. 23. Watanabe M, Hori T, Kaneko M, et al. Intrahepatic biliary cysts in children with biliary atresia who have had a Kasai operation. J Pediatr Surg. 2007;42:1185-9. 24. Kayahan E, Fukdem D, Haberal N, et al. MDCT of biliary cysts in children with biliary atresia: clinical associations and pathologic correlations. Diagn Interv Radiol. 2009;15(3):200-6. 25. Saito S, Nishina T, Tsuchida Y. Intrahepatic cysts in biliary atresia after successful hepatoportoenterostomy. Arch Dis Child. 1984;59(3):274-5. 26. Werlin SL, Sty JR, Starshak RJ, Glicklich M, Nathan R. Intrahepatic biliary tract abnormalities in children with corrected extrahepatic biliary atresia. J Pediatr Gastroenterol Nutr. 1985;4:537-41.